Krabi is a well known stop on the tourist map of Thailand. Ask anyone what there is to do in Krabi town however and nobody seems to know. 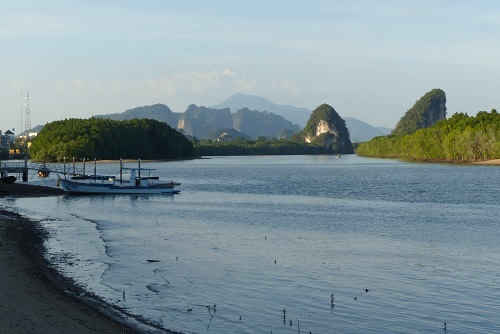 Railay Beach was repeatedly recommended to us along with canoeing tours and hot springs. The closest of these attractions is a 45-minute boat ride away. 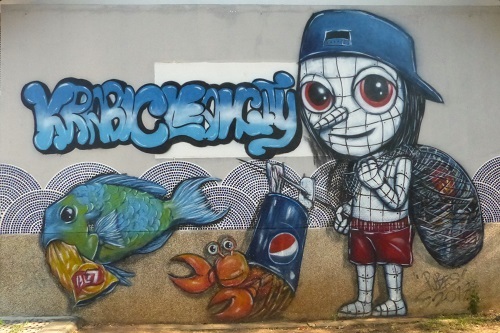 So, what does Krabi town itself actually have to offer? 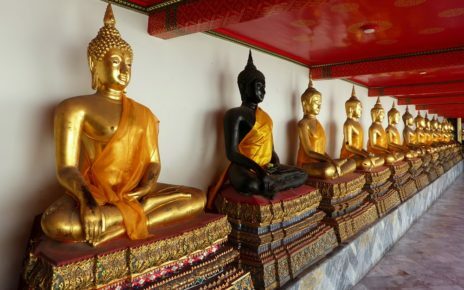 Once supposedly home to a real tiger, the Tiger Cave Temple is the number one attraction in Krabi. We found the tiger's cave tucked away at the base of a limestone cliff. It now houses a large tiger statue, plastered in gold leaf and surrounded by an army of tiny tiger companions. Other caves had stalactites and flowstone features with Buddha statues nestled among the rock formations. Some caves apparently had monks living in them and we saw their robes hanging on washing lines outside. 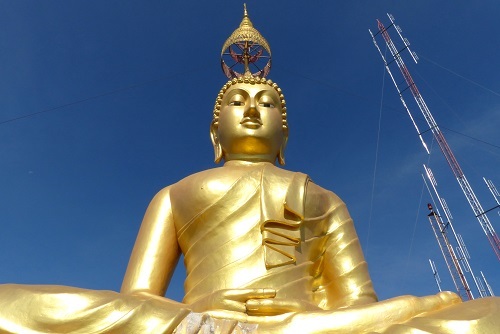 We sweated our way up the thousand or so steps to see the giant golden Buddha at the top of the mountain. It was worth the effort for the spectacular views across Krabi town, although we were ambushed by thieving monkeys on our way up. 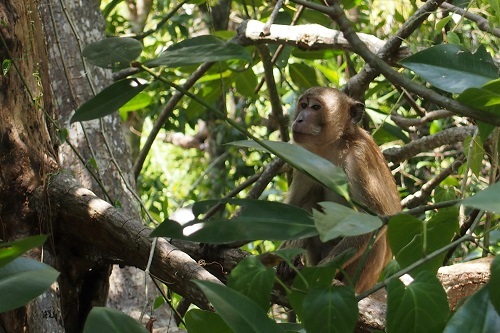 We met some friendlier monkeys near the centre of Krabi town. Nestled in among a tangled web of mangrove roots, we watched as a monkey patiently studied the shallow water. Darting forward suddenly, it snatched up a handful from the milky brine. It then spent some time carefully nibbling its new found snack. 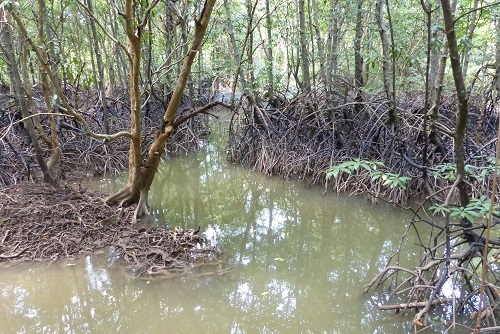 We continued along the boardwalk as it weaved through the mangrove. Spidery stilt roots branched out in all directions and phallic snorkel roots protruded from the waterlogged mud. It was surprisingly quiet and we didn't see another soul until we reached the end. 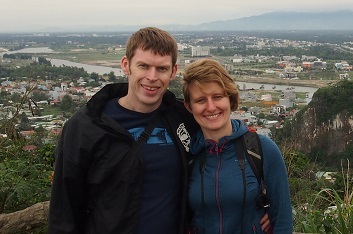 As the path fizzled out, we found ourselves right next to the iconic limestone cliffs at Khao Khanab Nam. A couple of older men sat by the river, fishing rods in hand while a lady sang quietly to herself. It was perfectly peaceful as we relaxed in the shade of a small pagoda. We listened to birdsong and amused ourselves watching hundreds of tiny fiddler crabs scuttling around on the mud. Later, foraging for ourselves, we ventured to Krabi Night Market. Walking into the square, the passed the usual touristy clothes stalls. These are easily recognised by the ubiquitous elephant print trousers, which no self-respecting Thai would ever be seen wearing. Despite the stalls of tatty clothes, the night market did have some good food. We munched on freshly fried corn dogs and coconut pancakes as we wandered, stopping to listen to a local school band along the way. We finally settled in the central seating area to enjoy the open mic karaoke on the main stage. 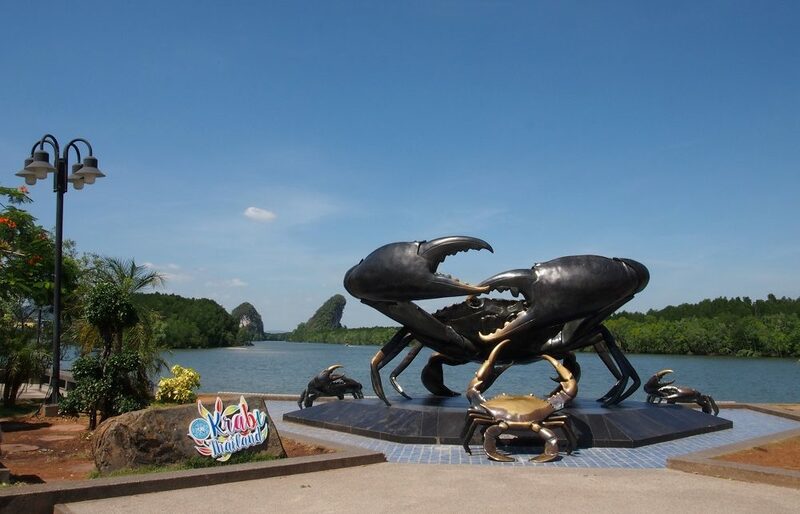 The giant metallic Mud Crabs Sculpture on the riverfront was another surprisingly popular feature of Krabi town. We saw a constant stream of tourists sliding their necks into the crab's pincers for that perfect photo. We were disappointed to learn however, that the name Krabi (which actually means sword) has nothing to do with these crabs. Krabi town was fun for a day or two but it's mainly used as a transport hub for those travelling on to the outlying beaches. The monkeys at the Tiger Cave Temple have a bad habit of stealing from tourists. Pack everything inside your bag so you don't lose it. Krabi Night Market is only open Friday to Sunday from 17:00 to 22:00. Plan your trip accordingly. The food on offer at Krabi Night Market is mainly snack food. If you're looking for something more substantial, try one of the cafes or restaurants lining the square. You'll still be able to sit outside and enjoy the live music and market atmosphere. 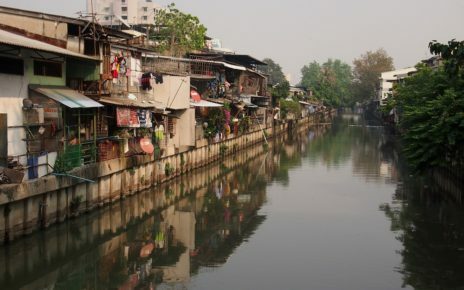 From the main riverside thoroughfare, Utarakit Road, turn off down a short side road. The side road is marked with a large blue sign. 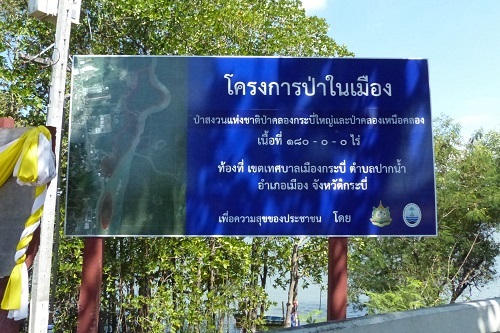 It's labelled on Google Maps as 'Mangrove Walk to the Khao Khanap Nam Cliffs'. 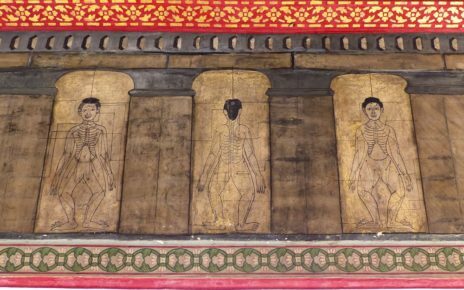 From Krabi town centre, it is around 9km to the Tiger Cave Temple, Wat Tham Suea. It is a straightforward walk, cycle or motorbike ride. However, it may be easier to take a minibus from the town centre. Red minibuses go straight to the Tiger Cave Temple. We took a blue minibus, bound for Krabi airport, that made a minor detour to drop us at the temple. Expect to pay 50 baht one way.